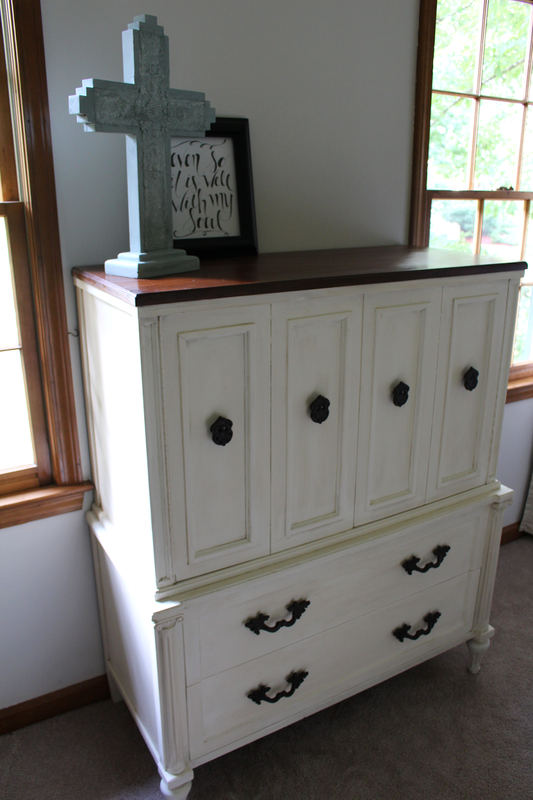 Brandi Nell the Southern Belle: Our New, Old Dresser! I don't think it's any secret that I love to go furniture thrifting. I love scouring the Facebook yardsale sites and I may have a mild obsession with browsing all of Craigslist (okay - not the gross "encounters" parts). Hubs and I have found a couple of really good thrift and estate sale stores of which we have had some major success. I'll be blogging about many of our finds next week. 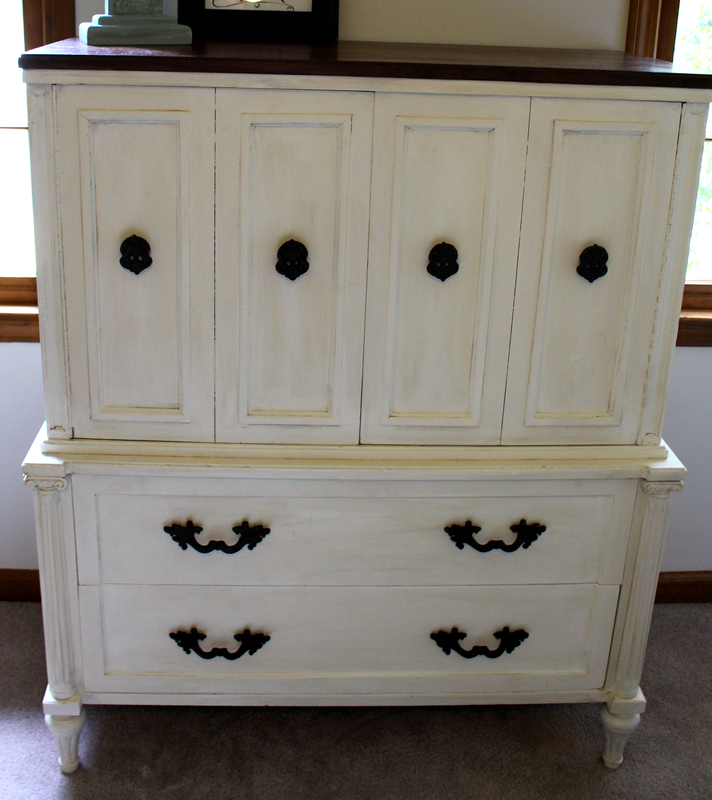 Today, I'll be telling the story of Our New, Old Dresser. 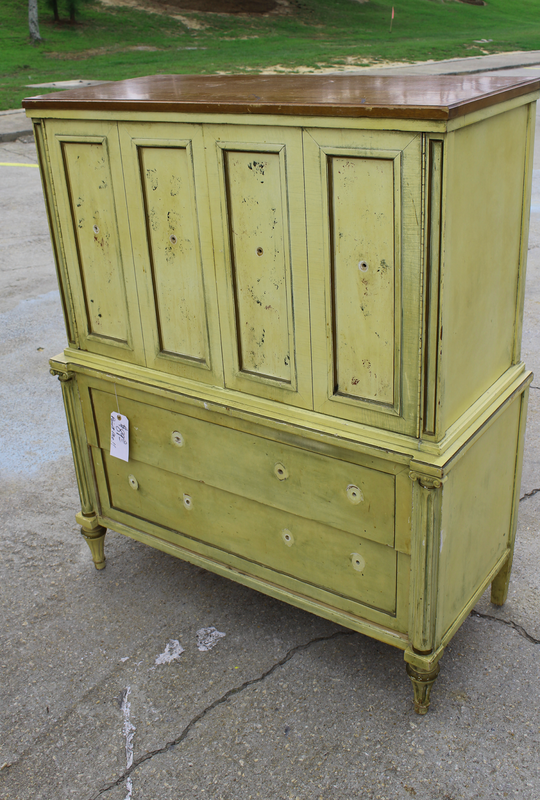 A few weeks ago, we were at our favorite furniture thrift store when this beauty caught my eye. I loved the structure of it. It had nice legs. You could tell that it used to have some design painted on the front of it (maybe flowers?). It was missing all of it's hardware - we had to pry it open with a screwdriver. But we loved the amount of storage it had. It was just the right size. 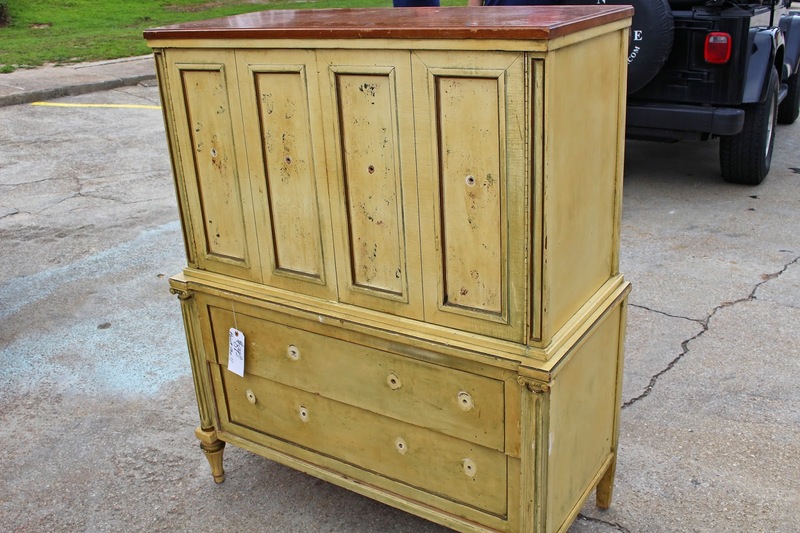 This was going to be the perfect dresser for our master bedroom. 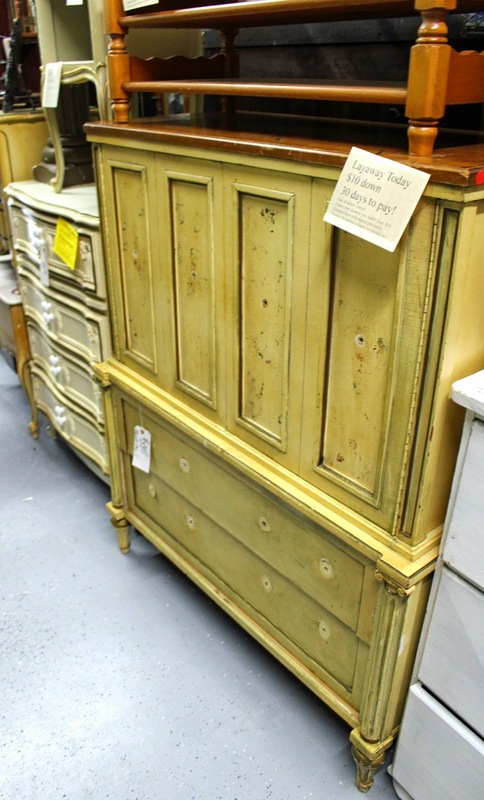 We hadn't planned on buying such a large piece that day. Luckily, we were able to load it up (with the help of the nice guys at the store) awkwardly in the back of Hubs' Wrangler. You may also notice the smaller table... I'll be sharing that little beauty with y'all next week too. Yes, we realize we looked like the Clampetts. After getting it home (and almost breaking our backs to get it out of the Jeep), we began studying to decide what we wanted to do it. I knew I wanted to keep the wood top unpainted. 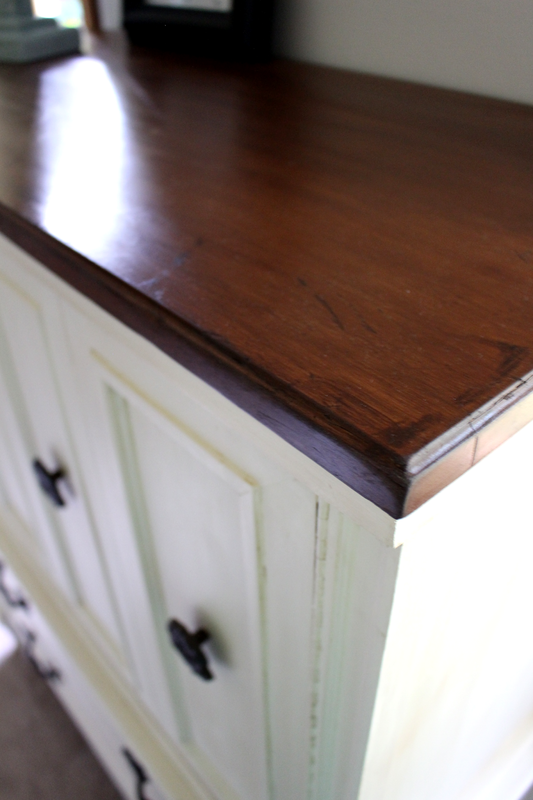 We lightly sanded the top and added some new gel stain. 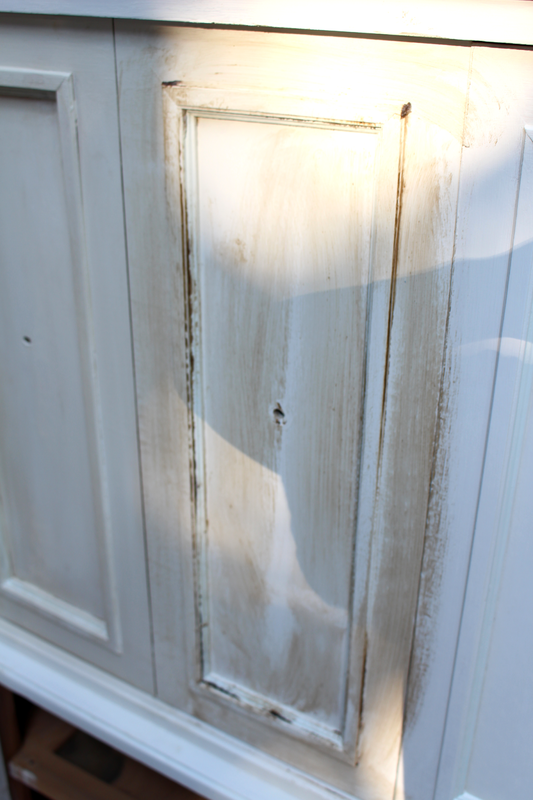 We applied two coats. It turned out so beautiful. I love the warmth of the brown. I'm so glad we decided to leave the top unpainted. 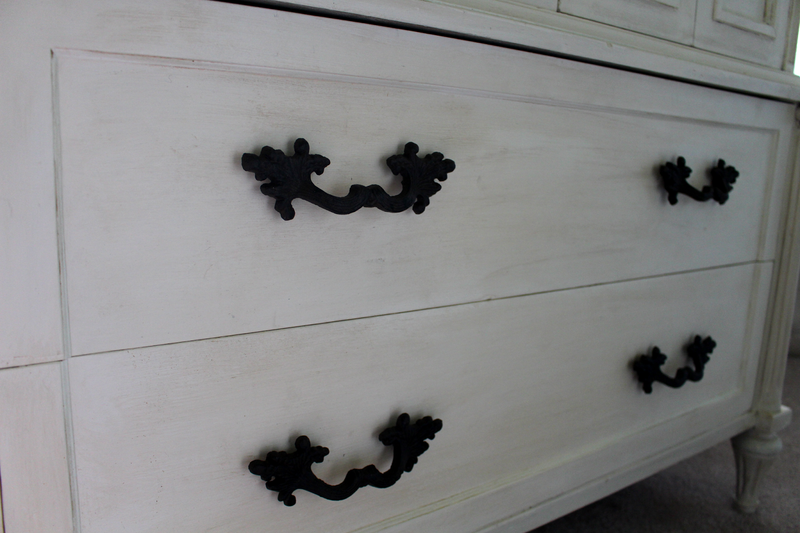 We decided to chalk paint the body with Annie Sloan Old White. Again, I can't stress how much I love this product. There is virtually no prep. 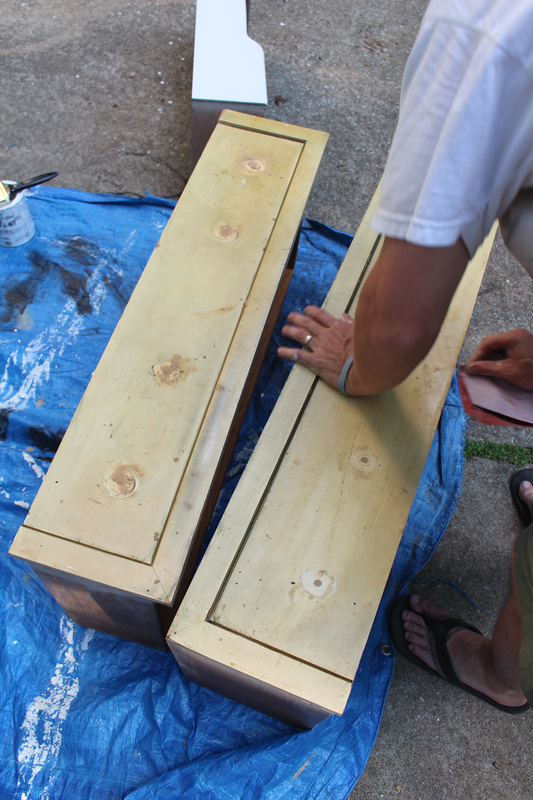 It goes on very easily and only requires about 20 minutes between coats. 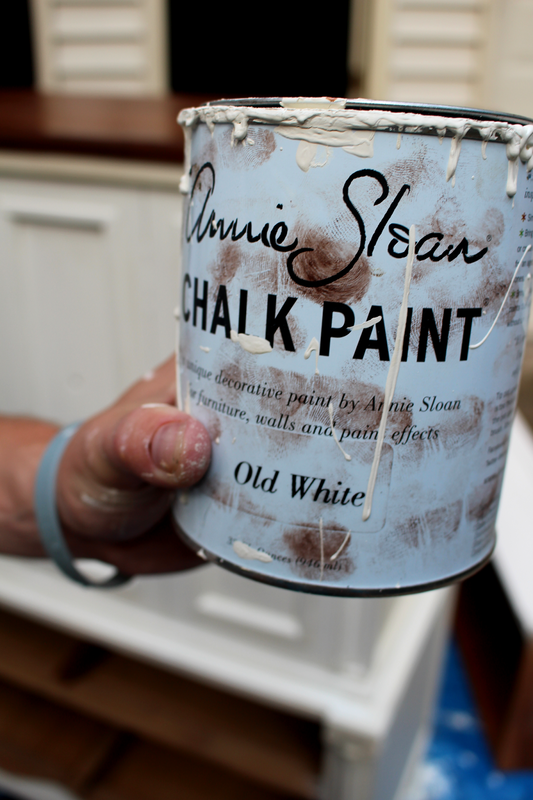 I like Old White better than Annie Sloan's Pure White. I find it much warmer than Pure White. This is pretty much my go to color for paint these days. 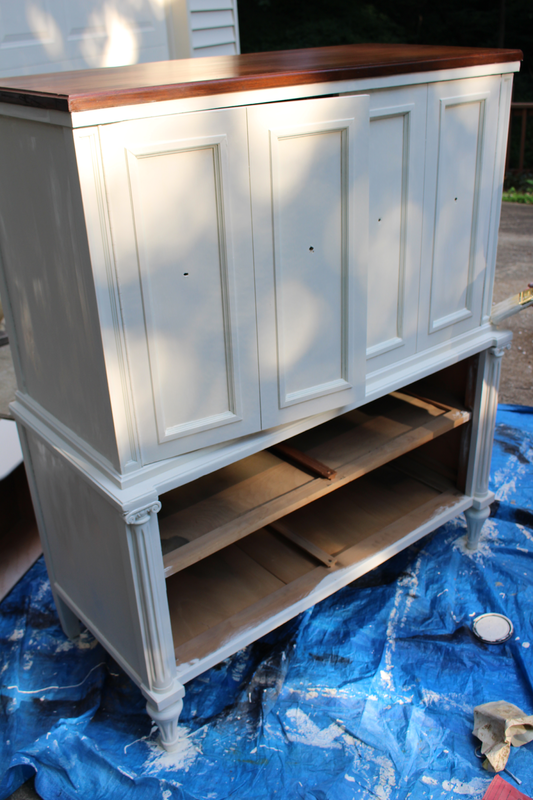 We gave the body two coats of Old White. I am in LOVE the details on the legs. 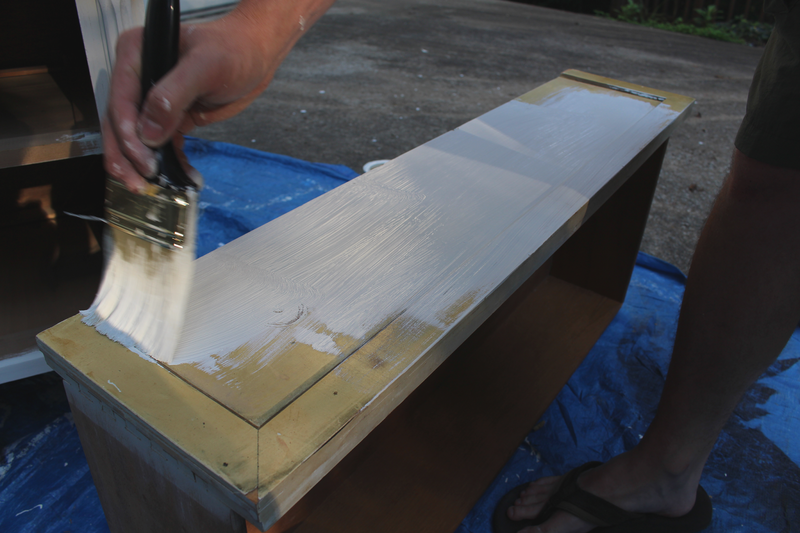 Once the body was complete, we got to work painting the drawers. 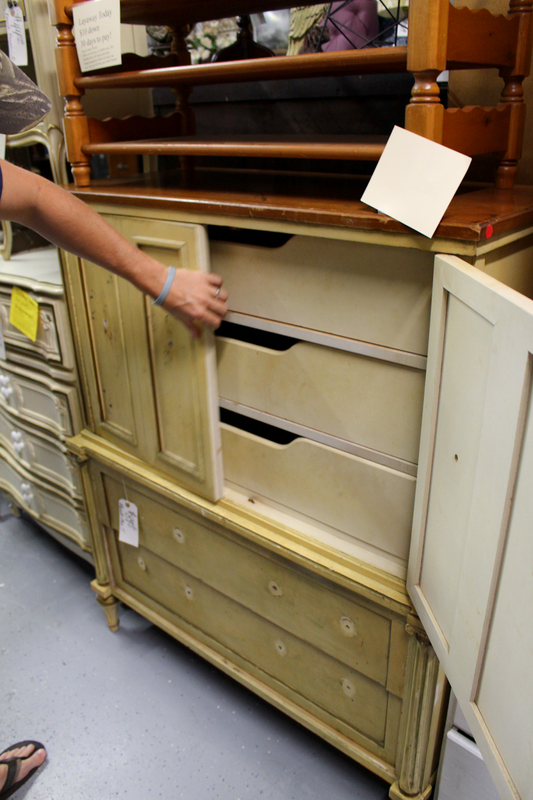 Once the body and drawers were completed - we stepped back to look at it and decided it needed a bit more "age." We decided to mix our dark and clear waxes for just the right amount of "age." 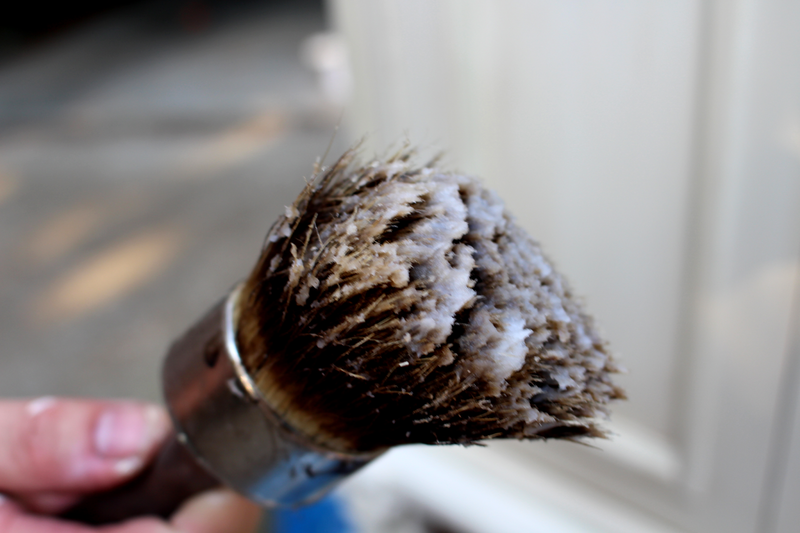 We use a wax brush to "paint" on the soft wax. We then buff it off with a cloth. 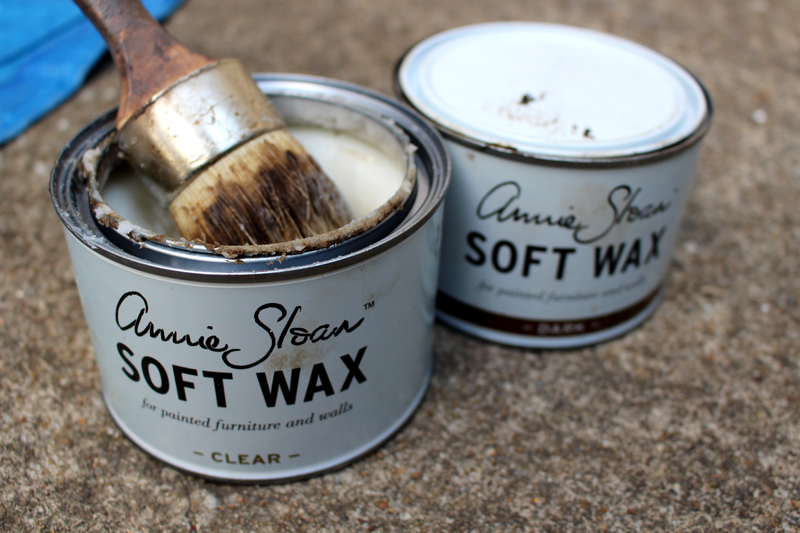 This image shows how we literally just paint on the soft wax. We let that sit for literally five seconds and immediately rub it off. The wax needs to cure for 24 hours. Once the wax had cured, we moved this puppy upstairs and added hardware. All of the hardware came from Hobby Lobby! Love me some Hob Lob. I wish the lighting was better in these photos. Best part? 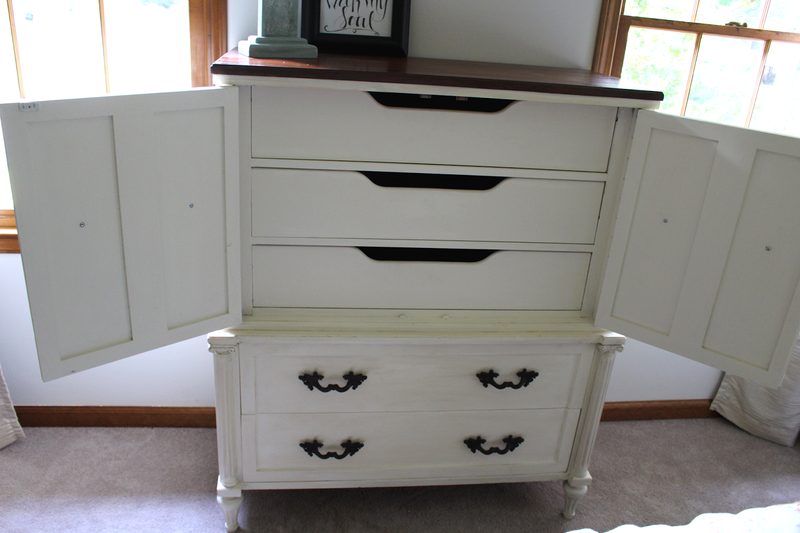 The dresser was only $75!! I had all of the paint and wax on hand. So we got this beauty for $100! I'd call that a good find. 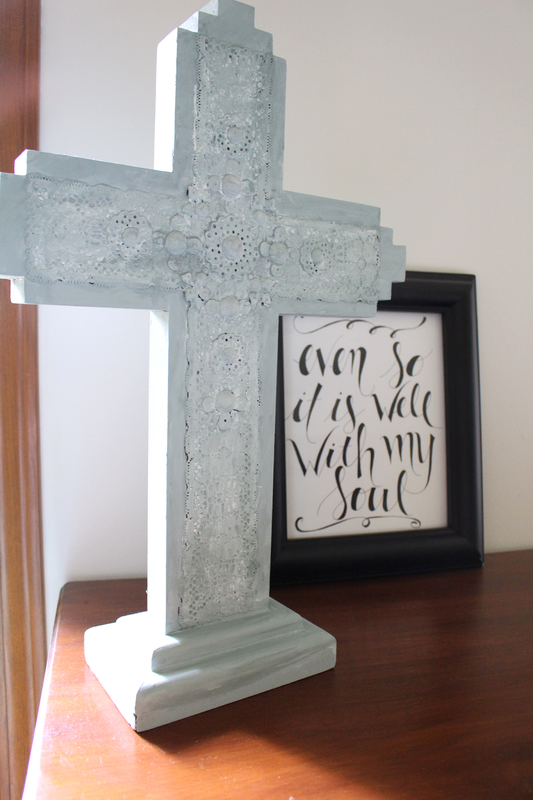 I also painted this cross with a layering effect with Duck Egg Blue and Old White. It was wood and brass before. It reminds me of lace now. 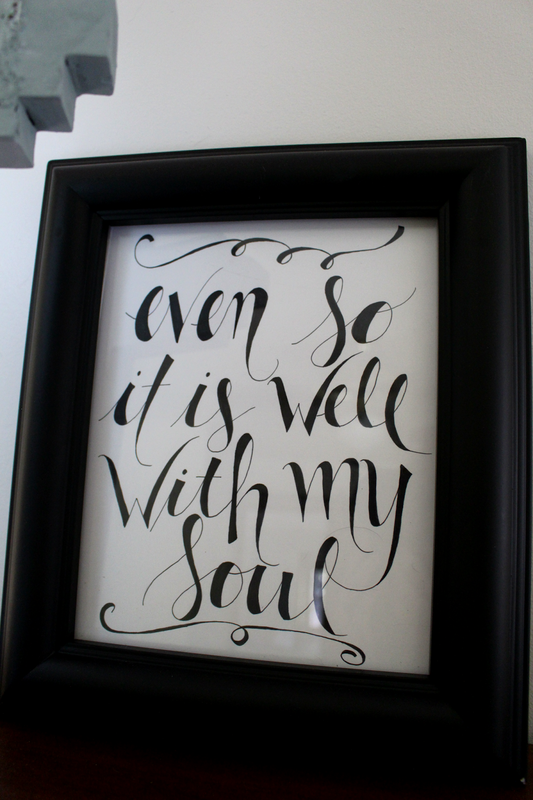 The "It Is Well" print is one of my new favorite things. My friend, Terri, from Ella Lou Boutique hand drew it for me. She does lots of beautiful, custom work. Be sure to check her out! I'm hoping to find an old mirror to go on top of the dresser as well. I guess I'll have to add that to my thrift store hunting list. Hope you guys have a great rest of the week. WOO HOO! Football season begins! GO EAGLES! *** This post is made up of my OWN opinions. 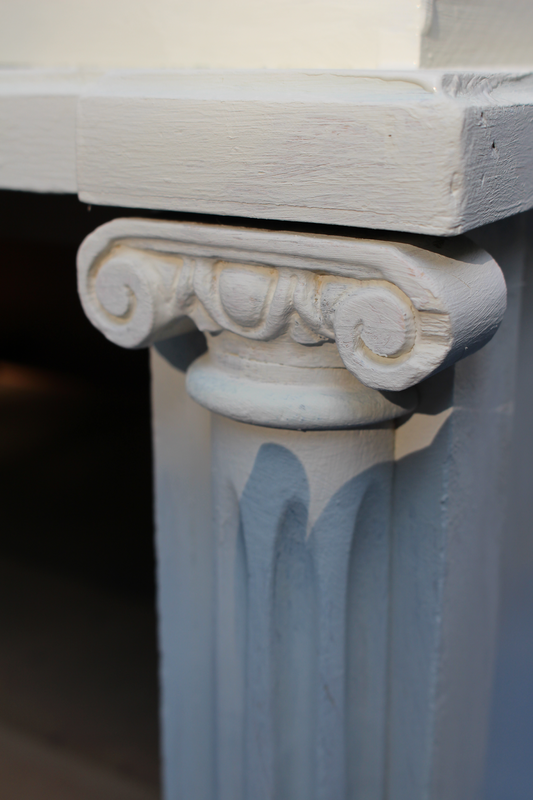 It is not a sponsored post by Annie Sloan or Hobby Lobby. BUT - if they DO decide to read this - I would consider that to be kick awesome. Love the storage unit. Me thinks you should open a store and sell these items.